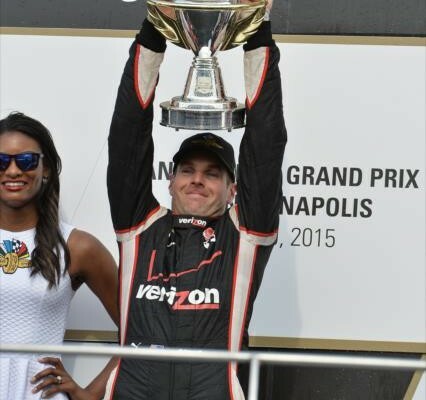 Prior to the green flag on Saturday afternoon, it was expected that the Indianapolis Motor Speedway would witness a duel between Will Power and Scott Dixon, the two men who successfully claimed the top two spots in qualifying one day previous. It would indeed be a battle involving Power and a red car, but certainly not the red car that was projected at the start of the day. 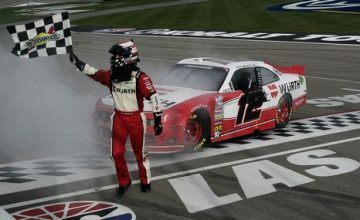 In the end however, Team Penske’s road course ace simply proved to be too much for the 24 other drivers put against him to handle, as the Australian led 65 out of a possible 82 laps to win the second running of the Angie’s List Grand Prix of Indianapolis. The fact Power led at the first corner was not the surprise it was what happened along with it that changed the fortunes of the day, eliminating some from contending for a win and making the possibility of victory a greater reality for others. The biggest loser would be Dixon, as incidental contact between himself and Power’s teammate Helio Castroneves would eliminate each of their chances right off the bat. Also out of the mix at the same time were CFH Racing’s Josef Newgarden, who was attempting to win back to back races after claiming the checkered flag first two weeks at Barber Motorsports Park in Alabama. 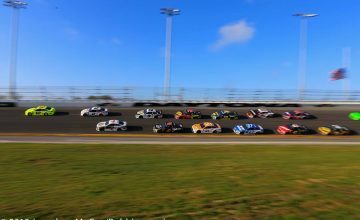 Jack Hawksworth, who led more laps than anyone in last year’s race on the 2.6 mile Speedway road course was also hampered, along with James Hinchcliffe and rookie Stefano Coletti, who had shown pace after topping the charts in the Saturday morning warm-up session. Perhaps the one to benefit most from the crash was Rahal Letterman Lanigan Racing’s Graham Rahal, who despite suffering to a 17th place effort in qualifying on Friday, managed to take advantage of the multi-car mishap to jump up to the sixth position after just one circuit. The question of course, was would the lack of pace shown by the Honda-powered machines during Thursday and Friday end up being too much for Rahal to stay in the mix? After the only full course caution of the race, Rahal dispelled the notion of having an inferior car to the Chevrolet by gaining another spot to fifth, and then his pit crew led by Ricardo Nault did the rest on the first round of pit stops to vault the No. 15 Steak & Shake Restaurants Honda into the runner-up position. From that point to the finish, Power and Rahal made it into a two-man duel with only a tiny bit of pressure applied by the Australian’s teammate Juan Pablo Montoya, who technically was also hurt by the first lap shunt when he lost three position due to taking avoidance to miss contact. In the final three stints of the race, Power and Rahal were very evenly matched. In the start of the stints, Rahal was able to get closer to Power, sometimes as close as 1.5 seconds, however the pole sitter would extend his lead in the second half of each run to a comfortable margin. Rahal’s effort to chase down Power was also erred by slower traffic, most notably by Scott Dixon and Gabby Chaves on his in lap just before his final scheduled pit stop at lap 62. Still despite the supposed gap in performance between the Chevy and Honda cars, Power had to eek out everything in his car, crew, and self to secure the win and force Rahal to accept runner-up honors on Saturday. Unable to keep pace during the final stint, Montoya still had to fight off a persistent Sebastien Bourdais from KV Racing Technology to claim the final spot on the podium. Bourdais, who was among the fastest on the opening day of practice on Thursday held on to finish fourth, while Chip Ganassi Racing’s Charlie Kimball quietly moved from being 14th on the starting grid to finish fifth, his first top ten effort since last year at Toronto. Despite the early contact both Helio Castroneves and Scott Dixon rebounded well in the remaining 81 laps to finish sixth and tenth respectively. With the Angie’s List Grand Prix of Indianapolis now in the books, the teams and drivers of the Verizon IndyCar Series will have Mother’s Day Sunday off before returning in their oval aero kits for the first official practice session in advance of the 99th running of the Indianapolis 500 on Monday. Stay tuned to Rubbings Racing for continued coverage of the month of May from the Indianapolis Motor Speedway.